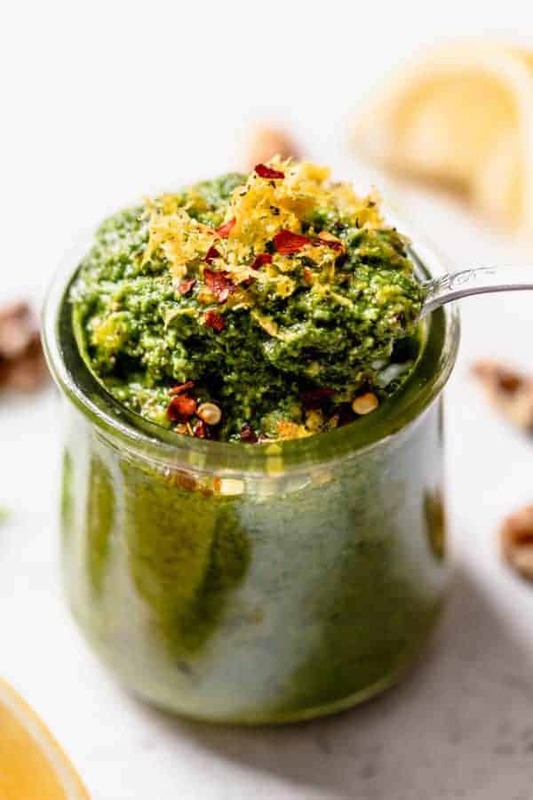 Light, flavorful and chock full of healthy fats, Basil Walnut Pesto is made with less than 5 ingredients and can turn ordinary into extraordinary in a matter of minutes. For two reasons. 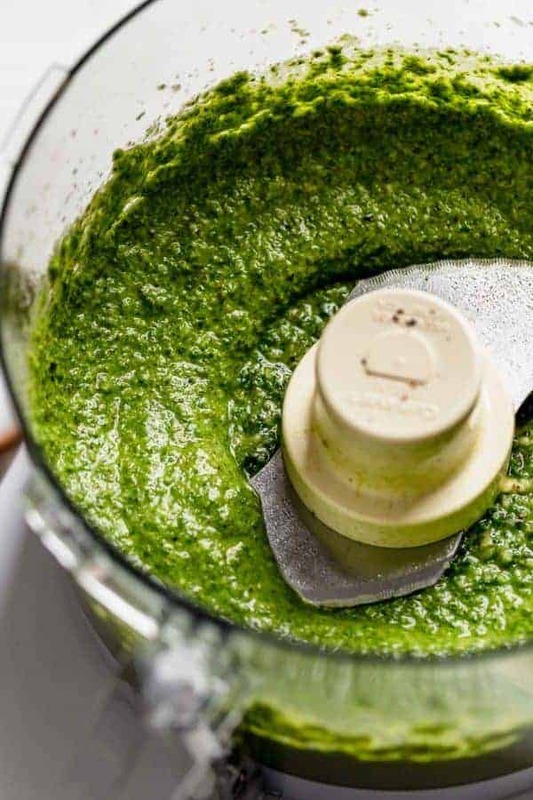 It’s magic in that all you have to do is toss a few ingredients into a food processor, let ‘er rip, and in seconds you have a delicious homemade pesto. Secondly, it’s magic in that it truly turns something ordinary into extraordinary in just minutes or maybe even seconds. For example, let’s take spaghetti squash, gluten-free pasta, a plain ‘ol chicken breast or zucchini noodles. 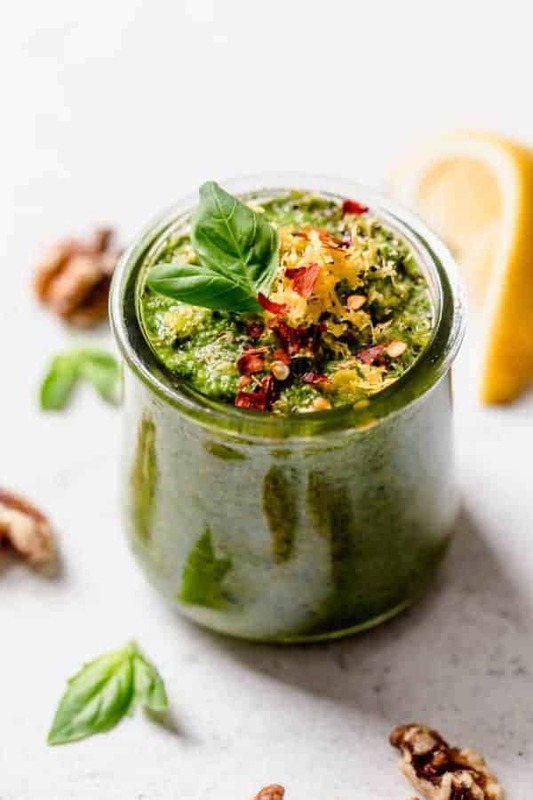 Add a little Basil Walnut Pesto to those somewhat bland foods and you’ll turn them into something totally scrumptious and full of flavor. 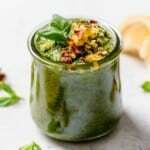 Traditionally, pesto is a simple sauce made of just five ingredients: fresh basil, garlic, pine nuts, parmesan cheese and olive oil. Our version veers slightly from the traditional recipe in that it’s made with walnuts to make it more budget-friendly (pine nuts are great but…$$$$) and we omitted the parmesan to make it dairy-free, paleo and Whole30-friendly. Lastly, we added some lemon juice to give it a subtle zingy flavor. For a nut-free pesto, simply substitute pumpkin seeds for the walnuts. Magic sauce for everyone! 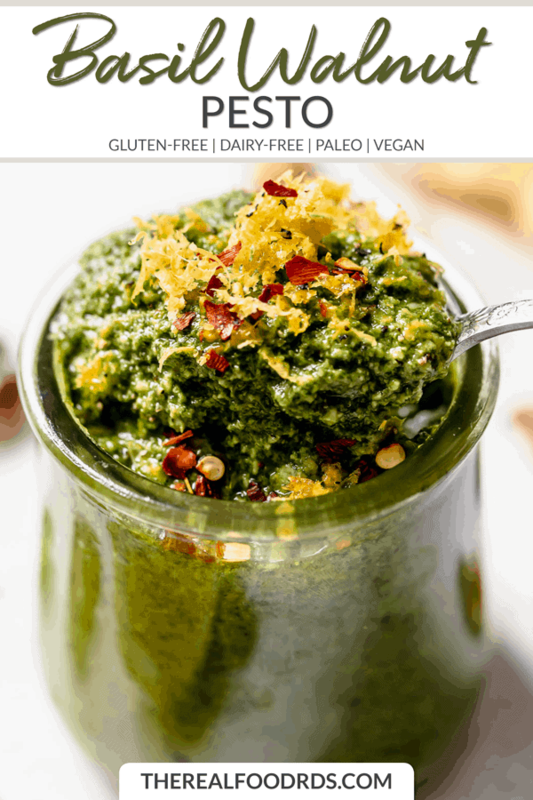 This Basil Walnut Pesto is chock full of healthy fats, specifically from a superfood nut. Walnuts are a great source of heart-healthy monounsaturated fats and plant-based omega-3 fatty acid. Plus, they’re rich in phenols and flavonoids giving them an anti-inflammatory and antioxidant edge over the pine nuts traditionally used in pesto. 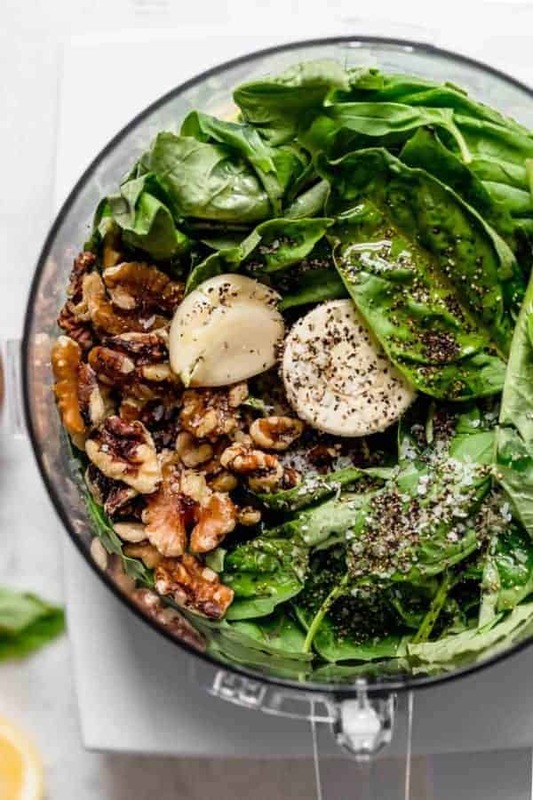 Beyond using walnuts in pesto, you can also enjoy them topped on a salad, oatmeal, yogurt, or added to cookies and muffins. Serve over roasted spaghetti squash for a comforting bowl of “noodles” you can really tuck into. Serve it over grilled chicken, fish, shrimp or steak for a mind-blowing boost of flavor. Toss it with your favorite roasted or grilled vegetables for a fresh, flavorful and easy side dish. Toss it with zucchini noodles or another spiralized vegetable noodle, add your favorite protein and you’ve got yourself a wholesome and tasty meal. Toss it with gluten-free pasta for a hearty, comfort-food pasta dish. 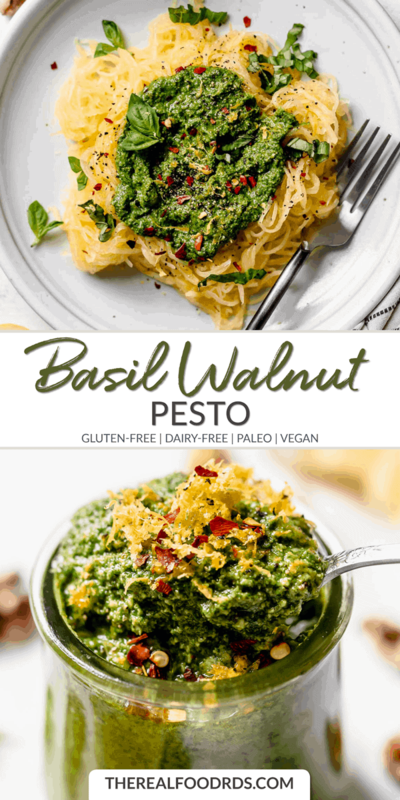 We’d love to hear if you give this Basil Walnut Pesto a try and how you choose to serve it! 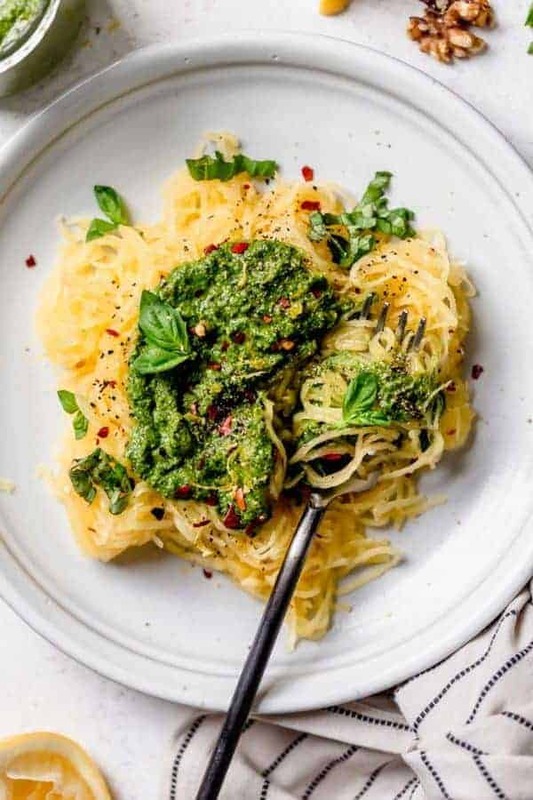 This light and fresh pesto makes an ideal topping for roasted or grilled vegetables, meat or fish or just a simple side dish when tossed with a bowl of zucchini “noodles” or spaghetti squash. To the bowl of a food processor, basil walnuts, ¼ cup olive oil, garlic and lemon juice. Blend until smooth, adding the final 2 Tbsp. olive oil through the chute in the lid while the motor is running. Taste, then add salt and pepper to taste. To keep pesto from browning, pour enough olive oil into the jar to completely cover the surface of the pesto. For longer storage, freeze pesto in ice cube trays then transfer frozen cubes to a zip-top bag. Thaw and use as a sauce or add frozen to soups or stews. All photos and content are copyright protected. Please do not use our photos without prior written permission. If you wish to republish this recipe, please rewrite the recipe in your own unique words and link back to the source recipe here on Simply Nourished Recipes so credit is given where credit is due. Thank you! Previous articleMedical News Today: Can blocking a single protein tackle depression, obesity, and pain?